Well this is not what I wanted to see. High pressure continues along the coast and will hold there for the next week (see map below). 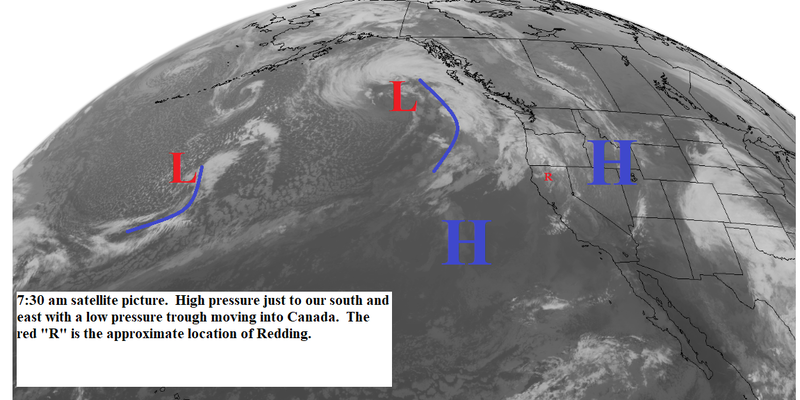 The jetstream will remain just to our north with frontal systems moving through the Pacific northwest. Northern California will remain mostly clear with a few clouds at times from the systems moving by to our north. Temperatures will continue above normal and we will have periods of gusty north winds. The longer range models still show the ridge weakening somewhat after the 7th. There are a few lingering clouds over the north end of the state this morning from the weak frontal system that moved through yesterday. Starting Tuesday we are back in the same old pattern (see map below), high pressure along the coast and the jetstream to our north. Tuesday through at least the start of next week the north state will be mostly clear with above normal temperatures. Gusty north winds will occur in some areas Tuesday through midday Friday. The longer range models show the ridge weakening a little around the 6th or 7th. This morning's satellite picture (below) shows a frontal system moving toward the coast. Most of the energy of this system will be pushed to our north. 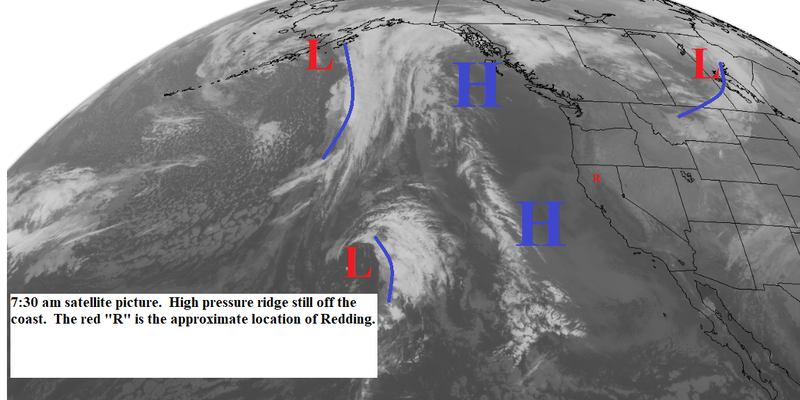 However, we will see clouds increase later today with light rain or showers north of a line from Ukiah to Redding to Mt. Lassen on Sunday. Clouds will be clearing out Monday as high pressure rebuilds along the coast. 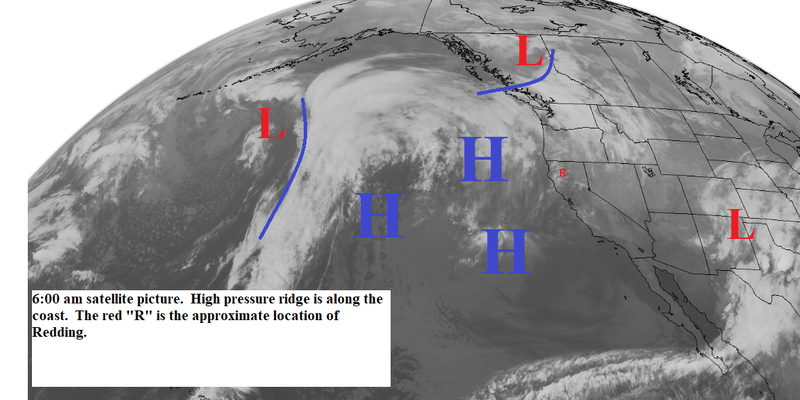 Tuesday through next weekend another strong high pressure ridge will be along the coast (see map below). Temperatures today will cool to normal or a little below Sunday and Monday and then back above normal Tuesday through the weekend. Gusty north winds will occur from Tuesday afternoon through midday Friday. 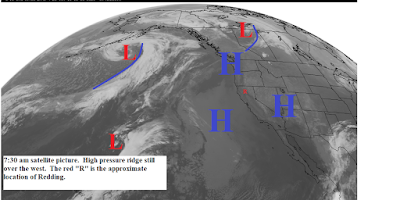 The high pressure ridge has weakened. This morning's satellite picture (below) shows frontal systems are moving by to our north. Today through Saturday the north state will be partly to mostly sunny with a few clouds at times from the systems moving by to our north. Temperatures will be above normal and winds will be light. Sunday a slightly stronger low pressure trough and frontal system will move through the area (see map below). This system will bring clouds and cooler temperatures to the area. Light rain or showers will occur along the coast north of Fort Bragg, the valley could see a few light sprinkles from Redding northward, the Sierra will see showers north of Plumas county. Monday the high pressure trough pops back up and we will have another 3 to 5 days of sunny mild weather. The high pressure ridge is a little weaker and has moved eastward. But...it is not going as far east as was expected when I wrote the last blog. This means weaker frontal systems. Today will be sunny tnen late Tuesday and early Wednesday a weak front will brush the far north end of the state. This system will bring a few clouds to the area with showers on the north coast and near the Oregon border. Another weak system will brush the area late Wednesday and Thursday with showers on the north coast. Temperatures will cool and Tuesday through Thursday will be near normal. Friday through the weekend high pressure rebuild along the coast. The jetstream will move back to the north and we will see a return of clear skies with above normal temperatures. A high pressure ridge is still over the west coast. However, the ridge is weakening and slowly moving eastward. Today through Monday Northern California will be mostly clear. Temperatures will slowly cool, but still be above normal. Winds will be light. Tuesday through Friday the low pressure area in the Gulf of Alaska will deepen and this will push the jetstream southward. Unfortunately, not quite far enough bring wet weather to the north state (see map below). A weak frontal system will move through the area late Tuesday and Wednesday. We will see a few clouds from this system with a few light showers over the northwest corner of the state. Temperatures will cool to near normal. Thursday and early Friday a slightly stronger front will move through. This system will bring light showers to the north coast and areas north of Redding. 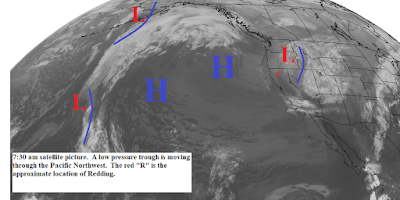 After this system high pressure will rebuild over the west coast. The high pressure ridge that has been off the coast has now moved eastward and is over the west coast. As noted in the last blog the main affect this will have on our weather is to stop the gusty north winds. The ridge will continue to move very slowly eastward. Today through the weekend we will have clear skies, above normal temperatures, and light winds. 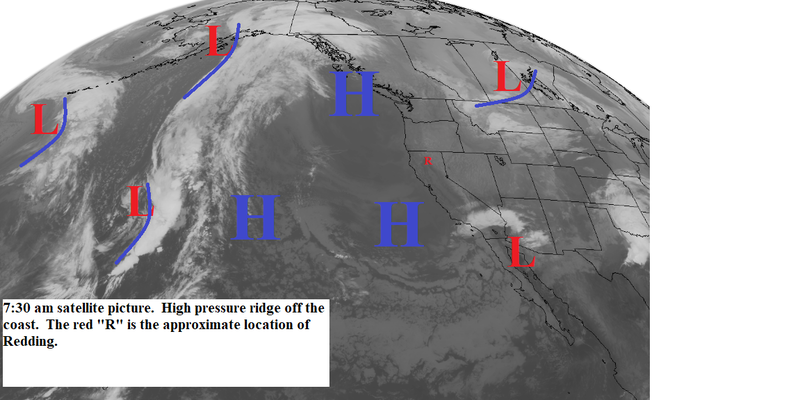 Early next week the high will be east of our area and a low pressure trough will off the coast (see map below). Notice the jetstream is still to our north so this will prevent any really wet storms from moving through the north state. However, the southern end of a frontal system will brush the north end of the state Tuesday and Wednesday with clouds and a few showers along the north coast and near the Oregon border. Temperatures will be back to near normal by Tuesday. The high pressure ridge is still just off the coast. The map below for the weekend shows a small change as the ridge will move a little east and be over the coast. The only affect this will have is to stop the periodic north wind outbreaks. Today through the weekend the north state will be clear. Temperatures will be above normal. Gusty northeast to east will occur today and Tuesday with lighter winds after that. Now for a ray of hope. The models all show the ridge continuing to move east and weaken. They also indicate a frontal system moving through between the 22nd and 24th. One model the European brings system strong enough to bring light precipitation to our area. The GFS (US) brings a weaker system through. 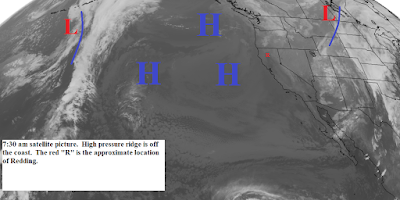 The large high pressure ridge continues just off the coast. The map below shows little change expected during the next week. Skies will be clear, temperatures will be above normal, and gusty north winds will occur today through Monday and again late in the week. Extended forecast models show the ridge weakening after the 2oth, but not enough to let the rain in. Not a lot to say today. A strong high pressure ridge is off the coast and as the map below shows will remain there at least through the weekend. Northern California will be mostly clear with a few clouds at times east of the Sierra Cascade Crest. Temperatures will be a few degrees above normal. Gusty north winds will occur in some areas today and again Thursday and Friday. There is some indication in the longer range models of the ridge breaking down around the 20th. Last night a low pressure trough and frontal system passed through the Pacific Northwest with the southern end bringing a few light showers to the north end of the state. Today there will be some lingering clouds over the areas north and east of the valley with a few light sprinkles. These clouds will clear by sunset. The rest of the north state will be mostly sunny today with near normal temperatures. Sunday through next week we will be under a weather pattern like the one shown on the map below. 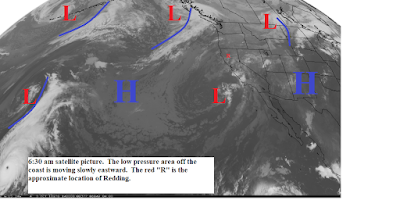 High pressure will be off the coast with a low pressure trough to our east. During this "in between" weather pattern we will have mostly clear skies with slightly above normal temperatures. Gusty north winds will occur tonight through Monday and again Thursday through Saturday.